Above photo courtesy of Holly Shaw of Wine not WHINE. Can we just go back to Lodi this weekend? That’s what I was thinking a few days ago as I was going through all the pictures I took and the thinking about all the fun we had and the great people we met. Sigh, back to the real world and my life as a pixel pusher. 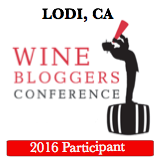 I think I might slightly have Post Wine Bloggers Conference Syndrome (symptoms include sadness, low energy, crying episodes–SOBBING, anxiety, and irritability). Of course I am kidding and I have some very exciting wine-centric things coming up in the next few weeks, so I am not sobbing at all. I am actually still buzzing with excitement about my first conference and wanted to use this blog post to tell you about one part of it in detail. 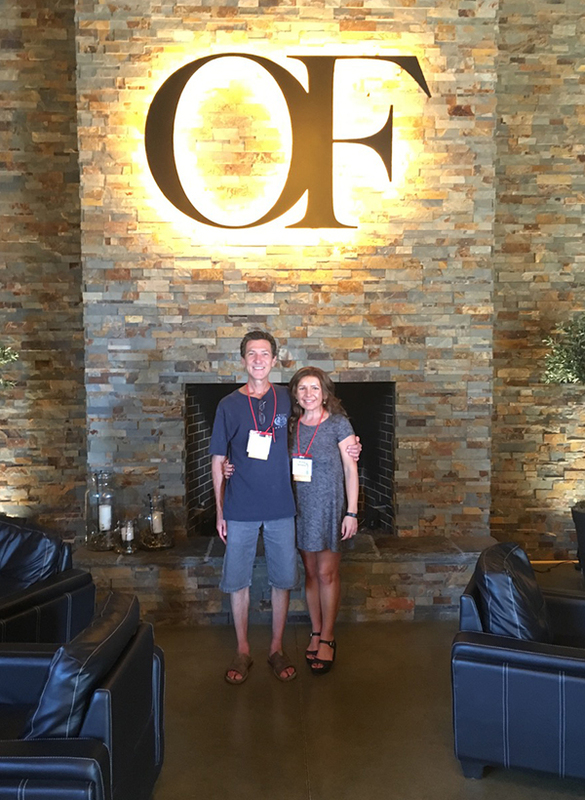 It turns out our destination was Oak Farm Vineyards for a tasting, tour, and dinner. Of course Friday night is pretty early on in the conference, so I was hoping for a winery I knew a lot about already and I didn’t know a thing about Oak Farm (though I had tried some of their Cabernet at the opening reception and thought it was good). 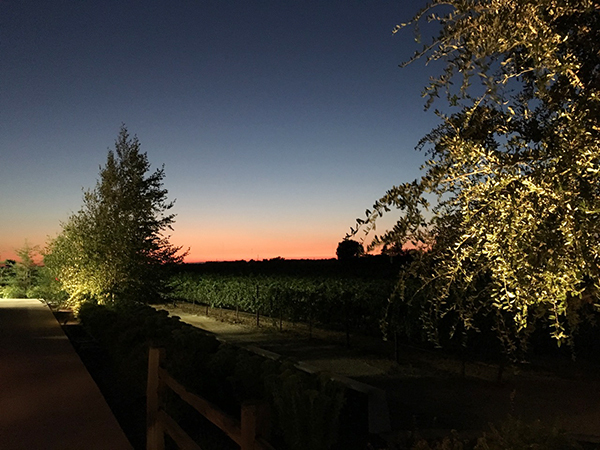 Andy and I are very local to Lodi, and are very fond of McCay, Michael David, M2, just to name a few, and I would have preferred any of those because I knew I would not be let down by the wine. It’s sad, because I get stuck in familiarity all too often, and many times it keeps me from discovering new and exciting things. My chagrin was only temporary, because my mind was about to be blown. It was dry and hot and I was very thirsty when we arrived at Oak Farm, and we were all led into a reception area to be introduced to Keith (tasting room manager), Dan (one of the owners), and Chad (the winemaker). 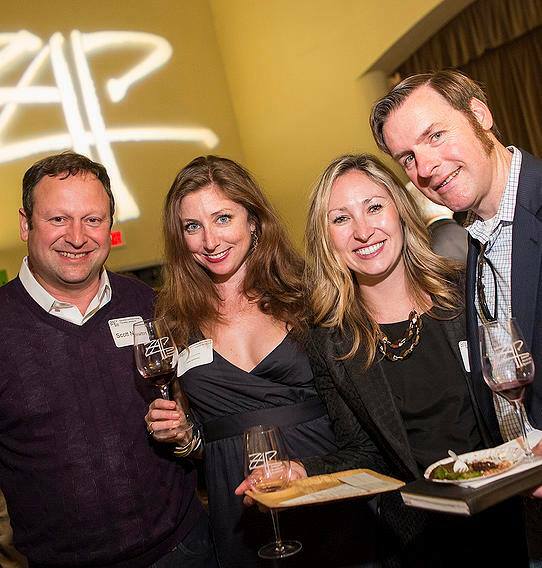 The introductions were paired with a crisp and cold glass of Albariño. 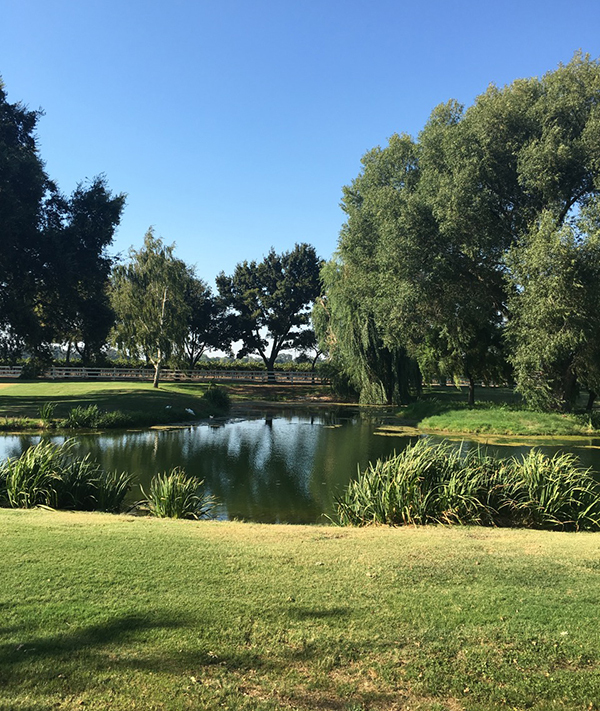 Albariño happens to be one of my favorite white wines, so I was very pleased to be tasting it in Lodi, and also that it tasted so wonderful. I’ll also mention it scored 95 Points and won a (Gold) Best of Class of Region Award at the 2016 CA State Fair Commercial Wine Competition. I took the above picture inside the room where we tasted the albarino. 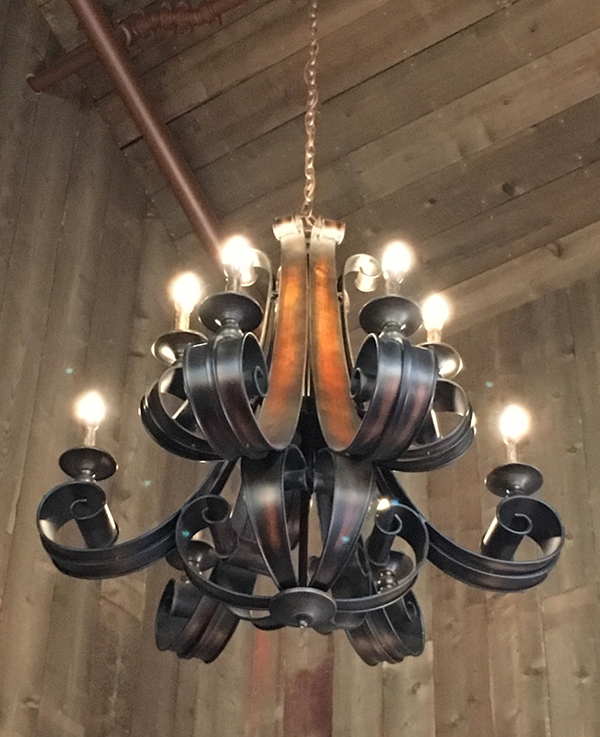 I love light fixtures, so I thought I would share this with you. Soon, our little group (including Holly Shaw of Wine not WHINE, Eli Med of Fine Wine Poet, and Maia Parish of The Wine Suite LLC, Heather Atherton representing Sacramento International Airport, Rhett Moffatt of Gone with the Wine, Steve and Charlotte Ferree of Wine Prof Guy, Jamie Gall of Minnesota Girl in the World, Maureen Blum of Mo Wino) was directed outside for a tour of the property. We walked down a path towards the main house through a field of Cabernet Sauvignon as we sipped the Albariño and got to know each other a little better. 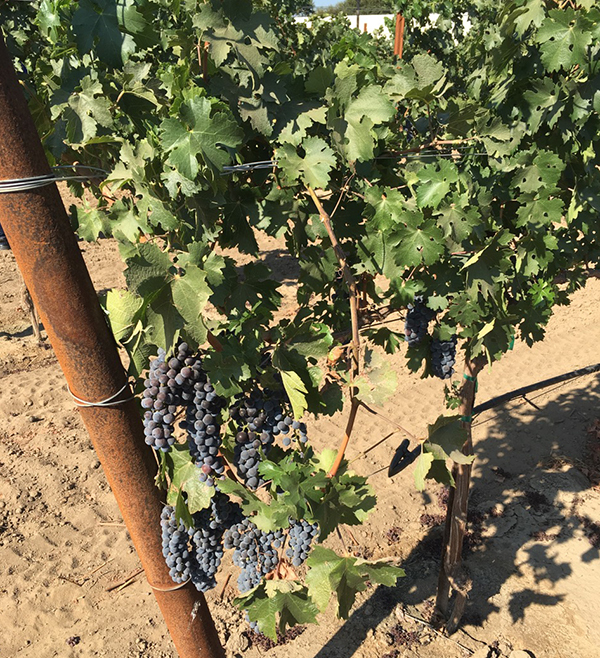 Other varietals grown on the Oak Farm property include: Chardonnay, Verdelho, Malbec, Zinfandel, Primitivo, Petite Sirah, Petite Verdot, Sangiovese and Barbera. 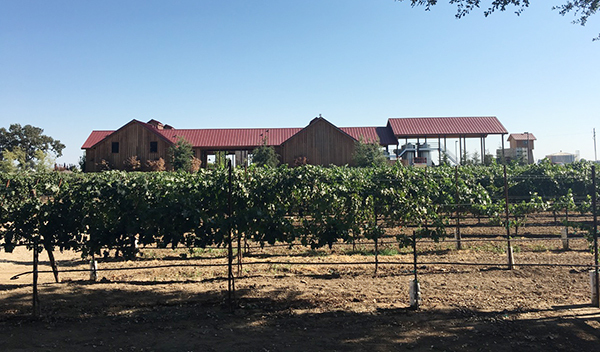 The aformentioned Albariño is sourced from two relatively new vineyard sites not on the property, but also located in Lodi AVAs: Silvaspoons Vineyard and Wetmore Vineyard. 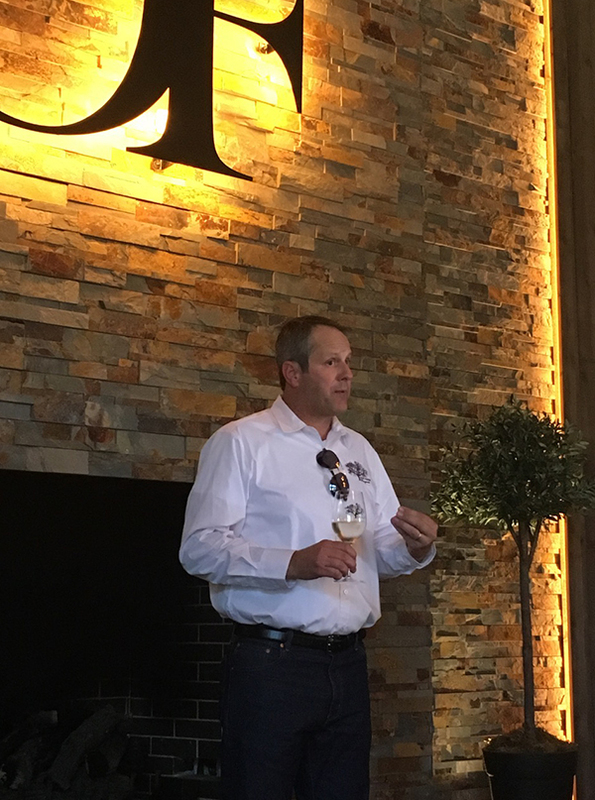 During the tour, tasting room manager Keith told us many stories on the history of the property, including tales of its original owner William DeVries, who purchased the property in 1860. 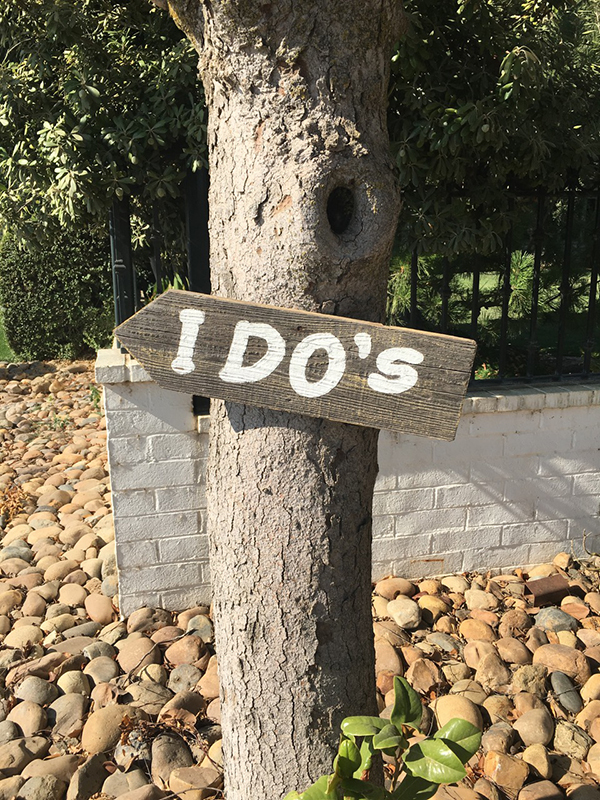 DeVries simply loved trees, especially oak trees, which to this day are allowed to thrive on the land, hence the name of the property and the winery today. The home on the estate was built in 1876 (it looks a lot like the house in Gone with the Wind (Tara), which is probably why the excursion was named Gone with the Wine. Eventually William DeVries became a congressman, a judge, and a legal authority on wine regulations in the 1930’s. Which if you think about it, the latter helps immensely when you are already growing grapes and producing altar wine during the prohibition era. Something tells me I would really get along with this guy! 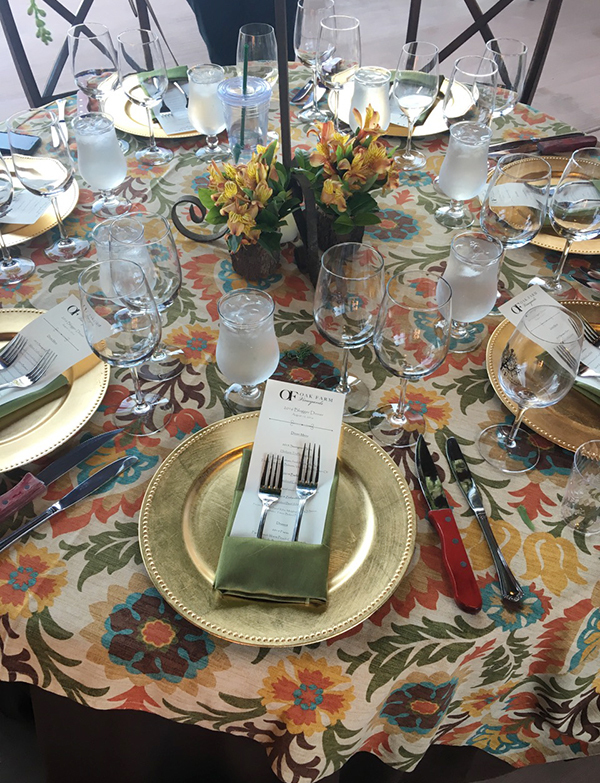 Oak Farm Vineyards is more than well equipped to host events big and small, and is the home of many weddings throughout the year. The winery actually happened to be set up for a wedding on the night we visited that would take place the next day. 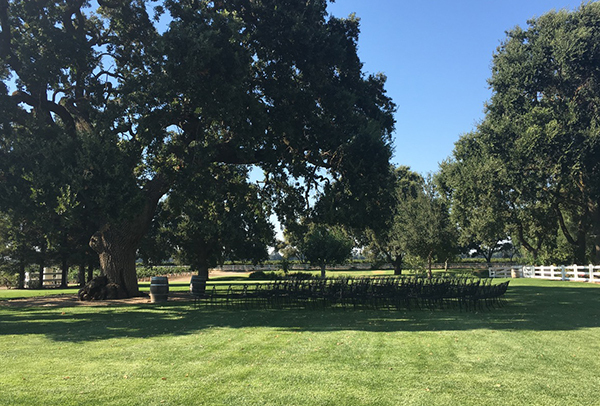 I can’t imagine what the to-do list at Oak Farm must have been like that weekend because of both its participation (and constant presence) at the Wine Bloggers Conference and holding a rehearsal dinner and a wedding simultaneously. To me, that makes our experience all the more impressive because I felt like the staff took their time with us and made us feel very welcome. 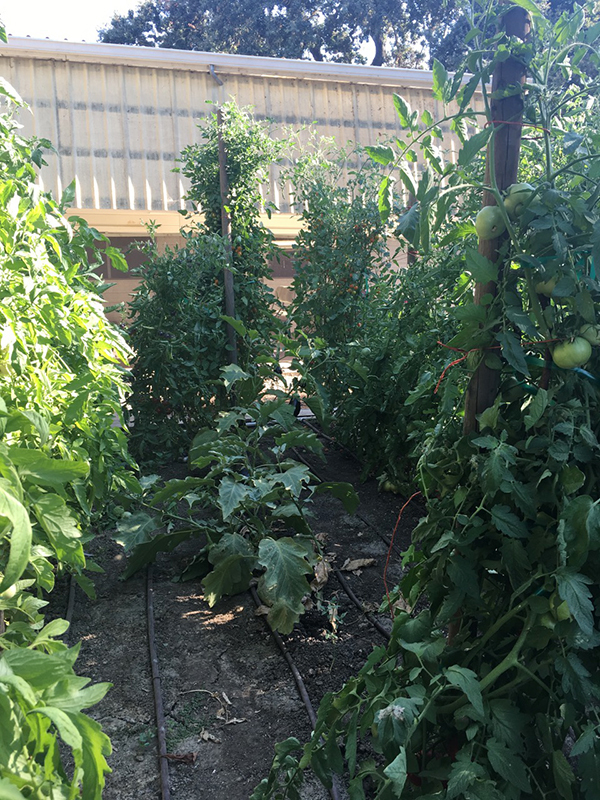 Of course, I have only talked about the glamorous side of Oak Farm Vineyards and the beauty of the property. 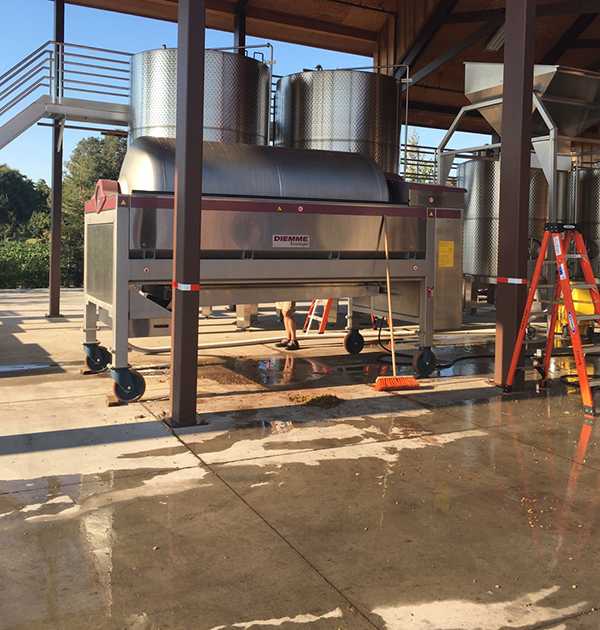 However, the truth is that wine making is not at all glamorous, and actually quite messy. 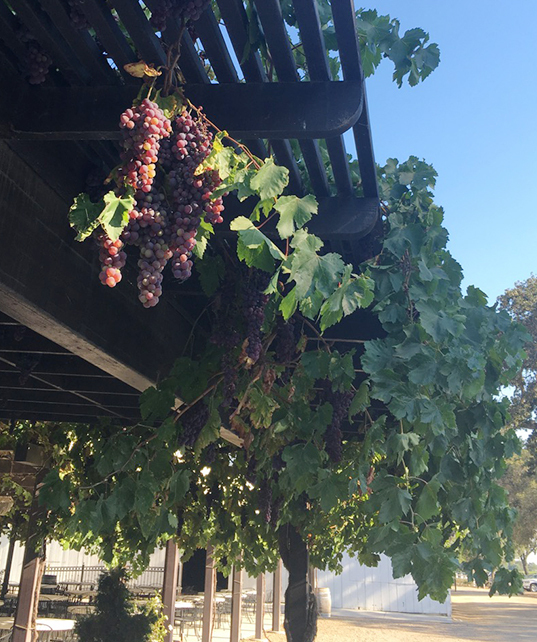 Above is a shot behind the scenes of one of the giant machines used to press the grapes. OK, back to the pretty stuff. 😉 How about this brick mantle inside the tasting room? We had to get a shot of us in front of it. 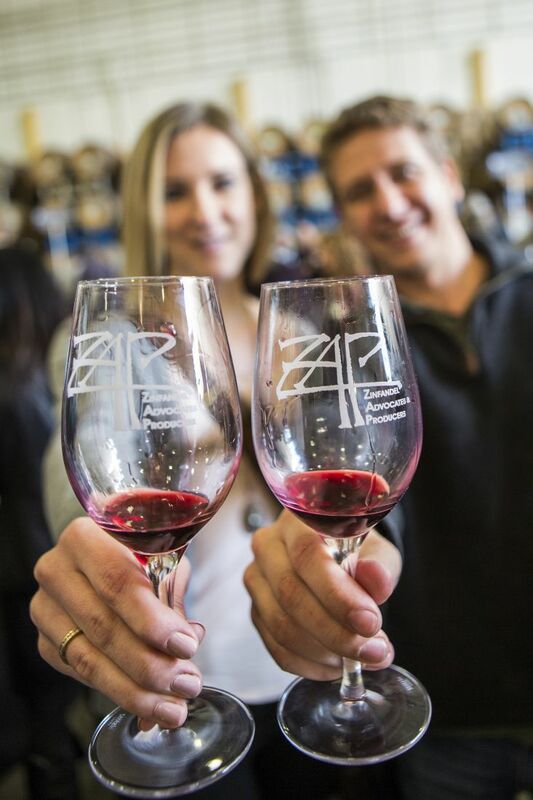 Thanks to the winemaker, Chad, for taking our picture below. Pictured above is winemaker Chad Joseph, who also makes wine for a few other labels in Lodi. Andy and I love his efforts at Oak Farm. I have to say that Lodi is so different than it was the last time I visited four years ago. It’s like they always made pretty good wine (as far as I knew having been in California and familiar to Lodi wine since 2004), but it is as if something good grew into something great in almost no time at all. We also had the pleasure of sitting with he and Keith during the dinner that evening which I am about to share with you! 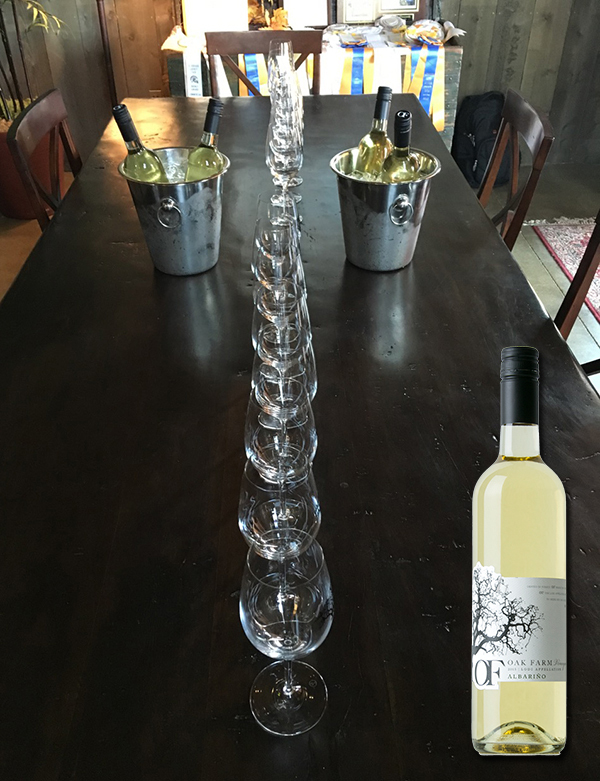 We felt particularly lucky to taste the 2015 Sauvignon Blanc which is currently sold out! The grapes were from the same clone (clone 1) that helped put New Zealand Sauvignon Blanc on the map. This one was more balanced than that with equal citrus and grass notes. It was a great pairing with the food, just strong enough to stand up to the cheese and the basil and the truffle in the dish. 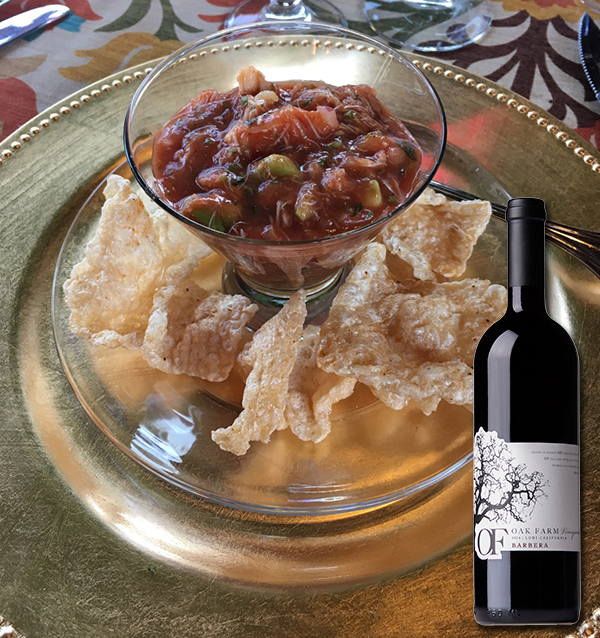 This Barbera received a Silver – Best of Class of Region – 2016 CA State Fair Commercial Wine Competition Award. 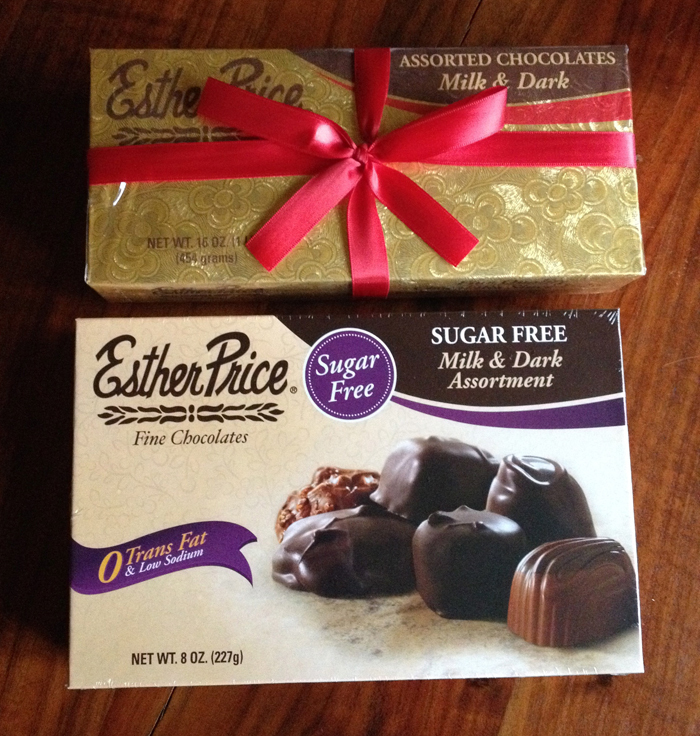 It also received a “two thumbs up, baby I’m down with that one” award from me. I’m not the only lady who loves it because it received Best of Show Red, Best of Class, Gold at the 2016 International Women’s Wine Competition. Ding! Then there was the food course. Midge was killing me with those pork rinds. I loved scooping up the seafood cocktail in those crispy, salty, fried pieces of pork. 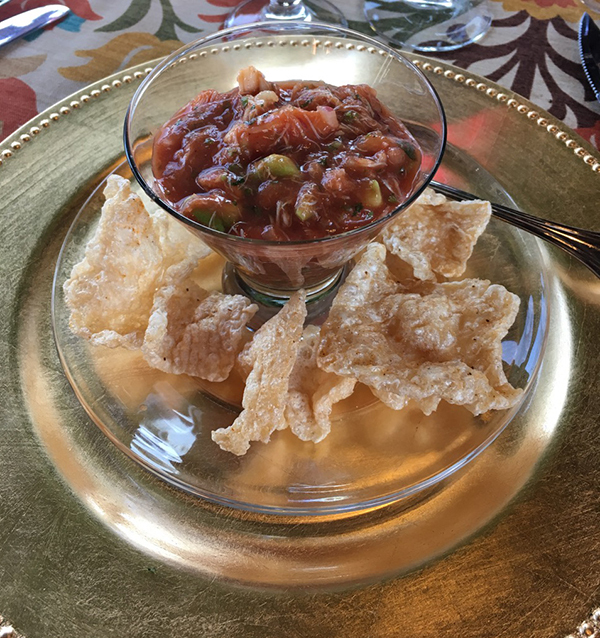 It was tomato, seafood, crunchy, porky bliss! OK I am dead. We can safely have my funeral right now (as long as everyone promises to drink Oak Farm wine at my service and watch a marathon of Robert Downey, Jr. movies in my honor). I mean, I’ll talk about the wine first, but seriously, look at the crust on that meat!! That’s the kind of crusty grubbin’ you dream about. The lobster mashed potatoes were a rich, decadent side dish. This course also brought us a glass of Oak Farm Zinfandel. 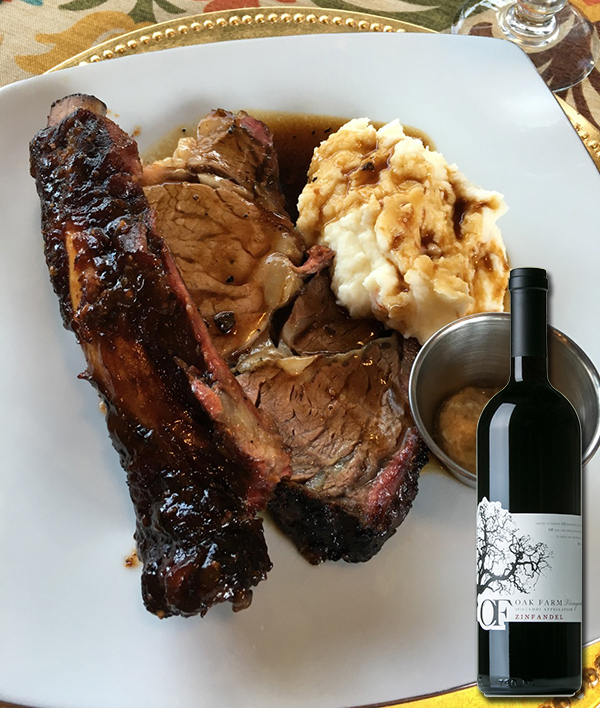 It was recently rated 91 points in Wine Enthusiast magazine. 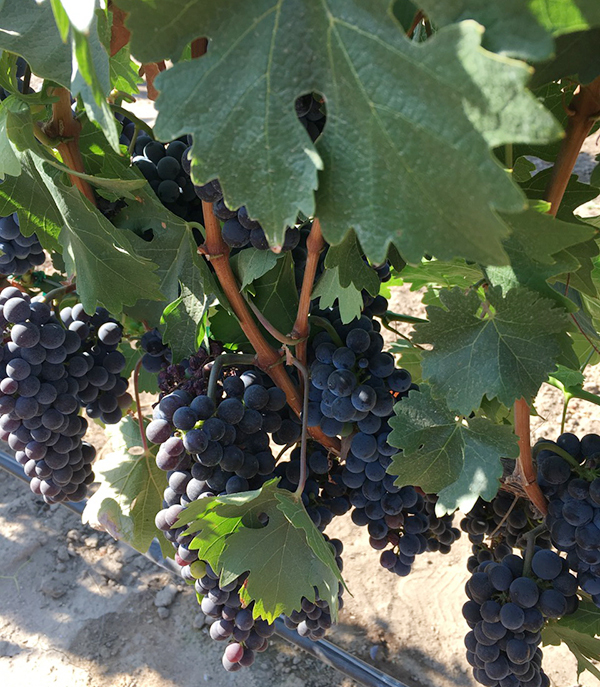 Are you still in doubt about Lodi wines?? 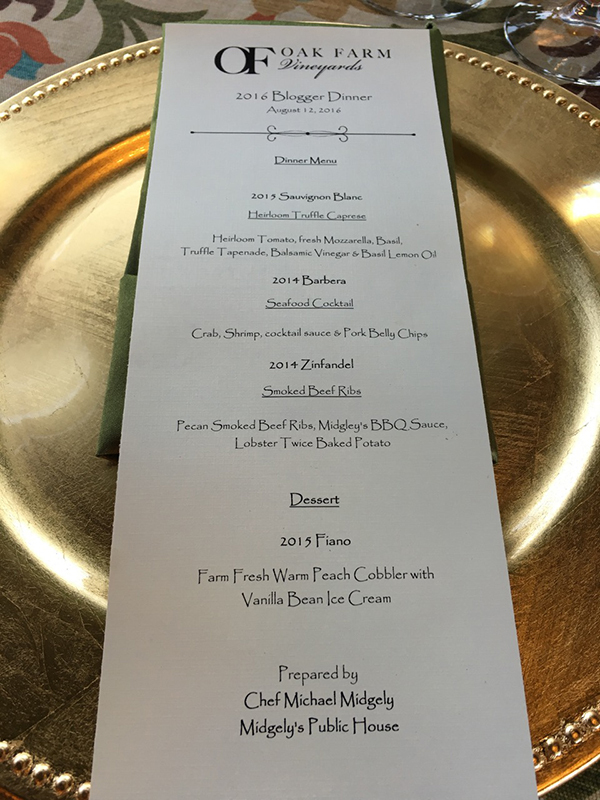 To think I didn’t even know about Oak Farm three hours before this dinner? Head still spinning. 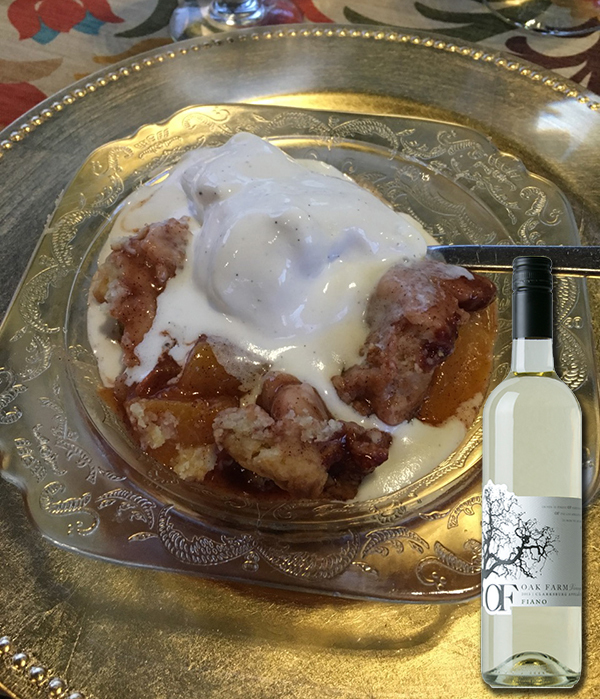 Dessert brought along a peach cobbler, much of which went to my partner-in-wine, Andy, while I fully enjoyed the dessert wine, Fiano. I was kind of longing for something even more simple like roasted nuts, dried fruit, and cheese, but I know I am odd that way and everyone else loved the dessert and ice cream. 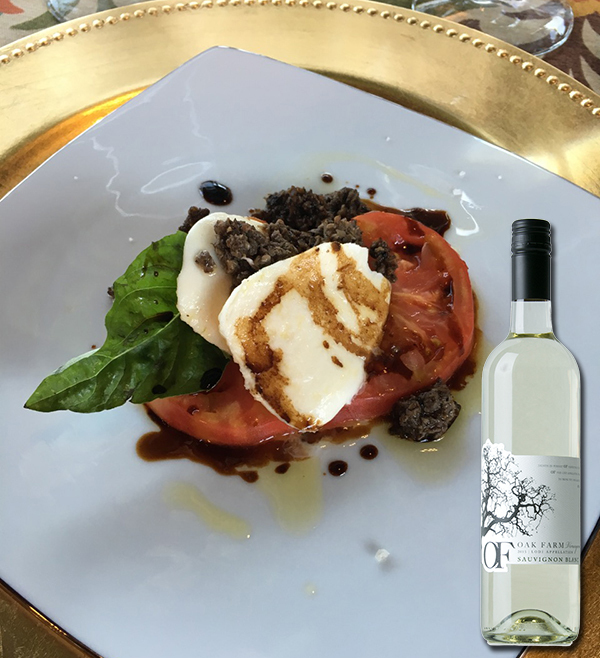 Fiano is an actual varietal, and this one was sourced from Clarksburg. The wine was an admitted experiment of Chad and Dan’s, but I really enjoyed it and was happy they shared it with us. Before we knew it, it was time to head back to our conference host hotels, and get ready for the next big day ahead! 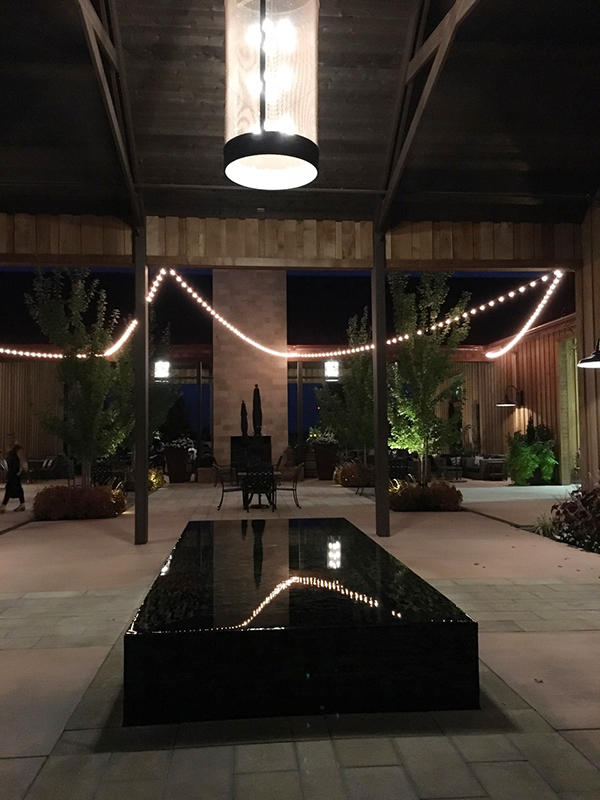 I snapped the picture below to show you how lovely the patio of the Oak Farm Vineyards tasting room looks like at night. I am sending out a huge thanks to the staff at Oak Farm Vineyards for hosting such an incredible excursion and making every one of us feel like we were family. 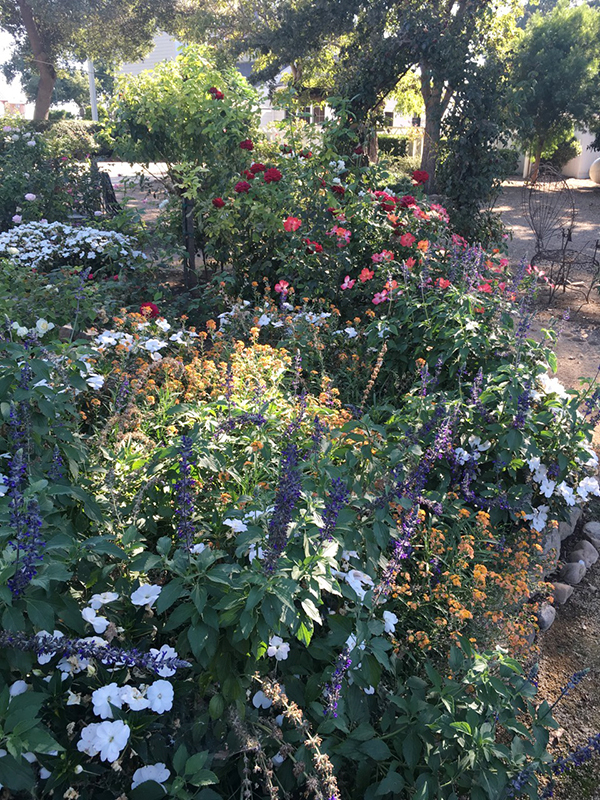 The next time I am in Lodi, Oak Farm will be one of the first stops I make because of the great memories I have there. 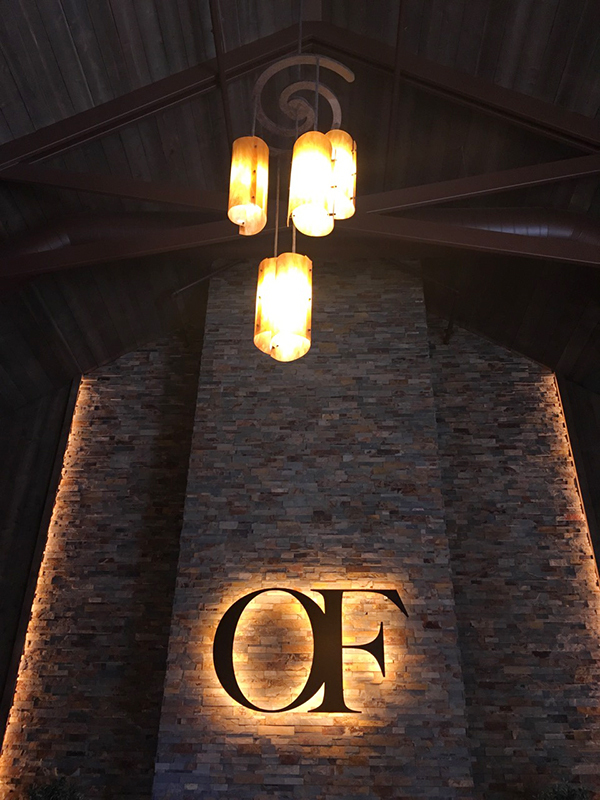 If you are local and have not yet visited, tasted, or experienced all that is Oak Farm, please put it on your immediate to-do list. 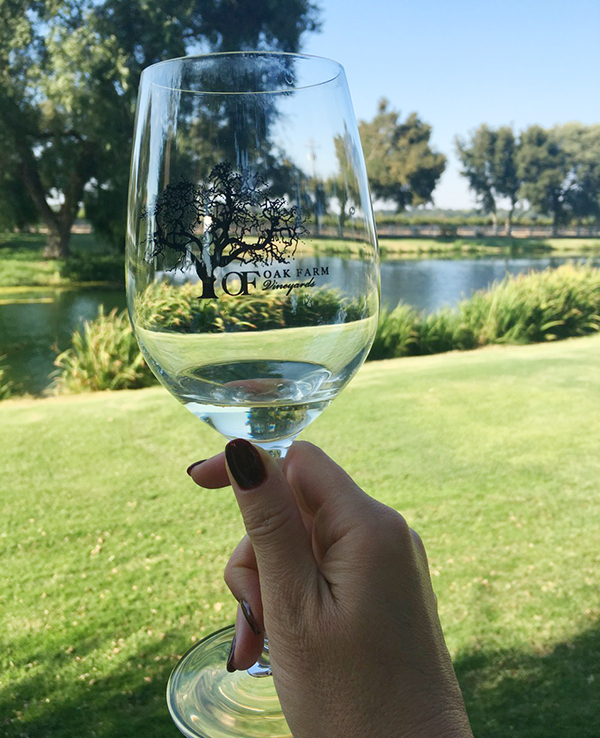 If you are not local, but you are a true wine lover, please put Lodi on your destination list, and put Oak Farm Vineyards on your trip itinerary. 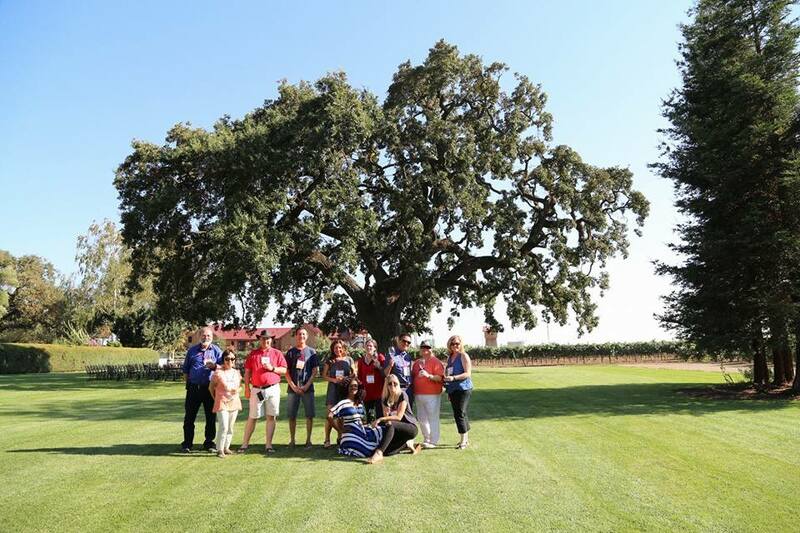 I recommend the Historical Legacy Tour ($30) which lasts about an hour and includes a stroll of the grounds through the vineyard while learning about Lodi’s wine history, the estate’s history told as you stroll past the family home, cemetery, barn and outbuildings, a walk through the first tasting room and lesson about Oak Farm’s beginnings, a walk through the new tasting facilities and barrel rooms, and a tasting in the VIP room. You can follow Oak Farm Vineyards on Twitter here and “like” them on Facebook here. 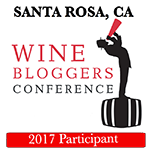 The next Wine Bloggers Conference is November 9-12, 2017 and will be located at the Hyatt Vineyard Creek in Santa Rosa. Will I see you there?